Bright, pale gold. Rather unspectacular. But the nose, which takes me immediately for the malt. Springer is just different. Absolutely typical scent. Here you notice primarily the aromas of Bourbon barrels. Sweet, light honey, freshly ground cereal, but also oysters and fresh crabs. Quite behave also vanilla and freshly baked brioche knots. Again and again, typical jumping notes such as beeswax or sea aromas in the nose. The LB 09 can not deny its (semi-) island origin and apparently does not want it at all. And the alcohol? Although it is anything but intrusive, if you put your nose too deep into the glass, the cask strength counters with power and aromas, which immediately make you think of Springbank's great new make. Respect and patience are undoubtedly rewarded while enjoying. The nose is fun, but our hero celebrates the first really big triumph when the malt slowly makes his way towards the palate. The more than voluminous mouthfeel is silky and strong alike. Clear plus. Sensational for such a young malt. The first impression is that of an elegant malt, even if he has to let the 16er predecessor in this category easily precedence. The peat influence is perceived in LB 09 tasted only very subordinate. But the honey from the nose comes back. With ripe yellow plums, or are they juicy nectarines? Class anyway. Smoke and fruit mix with some restrained, slightly oaky notes to a perfectly matched whisky experience. Young and just great, you almost want to say. With the best that I had on 2.5x burned jumpers in this age group so far in the glass. Ah ... there comes the smoke, now much more present than on the tongue. Slightly mineral and now indeed undeniably smoky, the LB comes with plums and sweetish elements. Still strong in the finish, slightly 'strawy' it looks in the finish. The much-touted character of the distillery, often referred to as 'farmy & funky', is beautifully released. 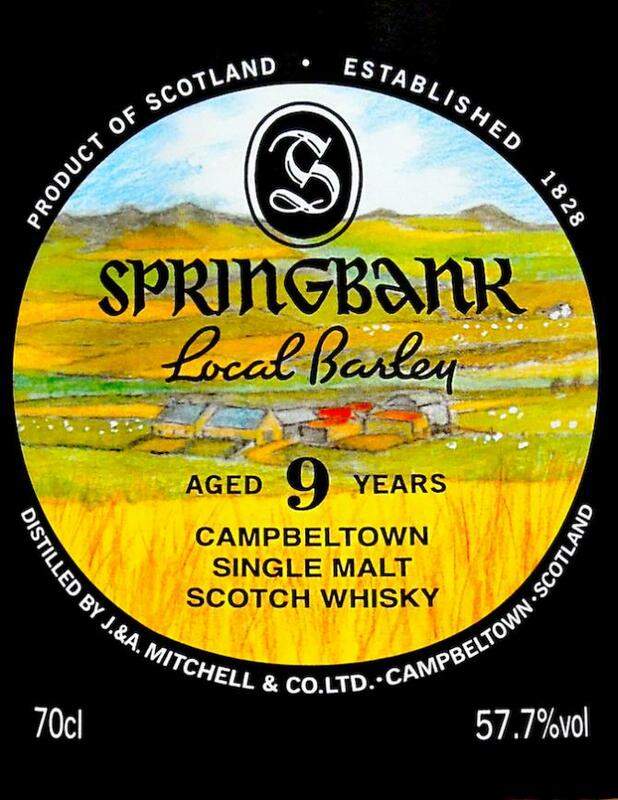 I’ll be honest, I did not expect to buy the 9 year local barley because the price is getting very high...but Springbank would not be denied. The first thing that struck me was how peated this is. The most peated Springbank I have had I think. Lots of great ashy notes. It’s very fresh with peaches, mandarin orange, very juicy. That classic Springbank minerality, wool, but a great saltiness to really drive it all home. I should just forward my paychecks to Campbeltown. 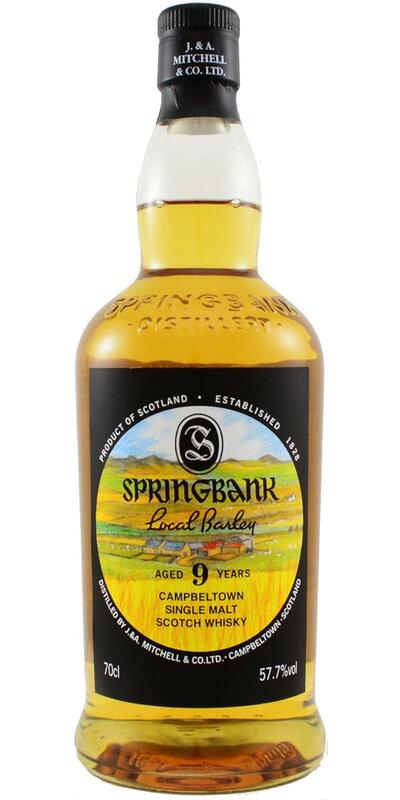 Springbank actually works very well young, and Local Barley 9yo is no exception. The prices are probably not around to say a few words about it, although I find price considerations rather tiring. 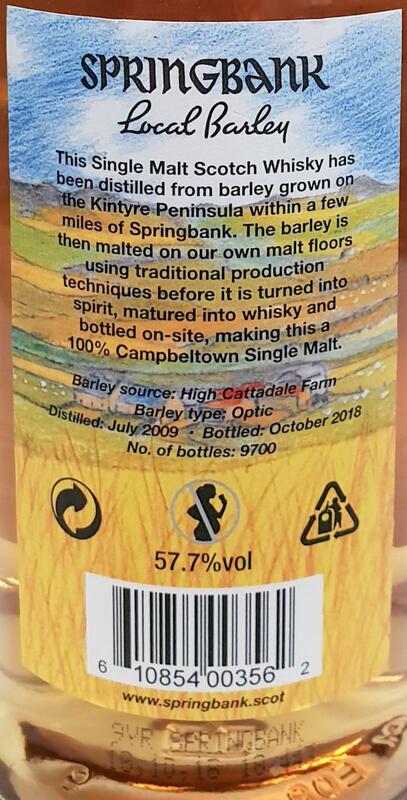 As the fourth issue of the current Local Barley series is still available in numerous shops weeks after it has come on the market, shows that now probably the flagpole of what is now the decent Springbank friend is ready to pay for a young, not so badly distilled whisky of this distillery. Whether this will lead to a rethink? Probably not. Partly he was here in Germany for 85, - went over the counter. That's OK.
Fruity and fresh with mandarin juice and mango. 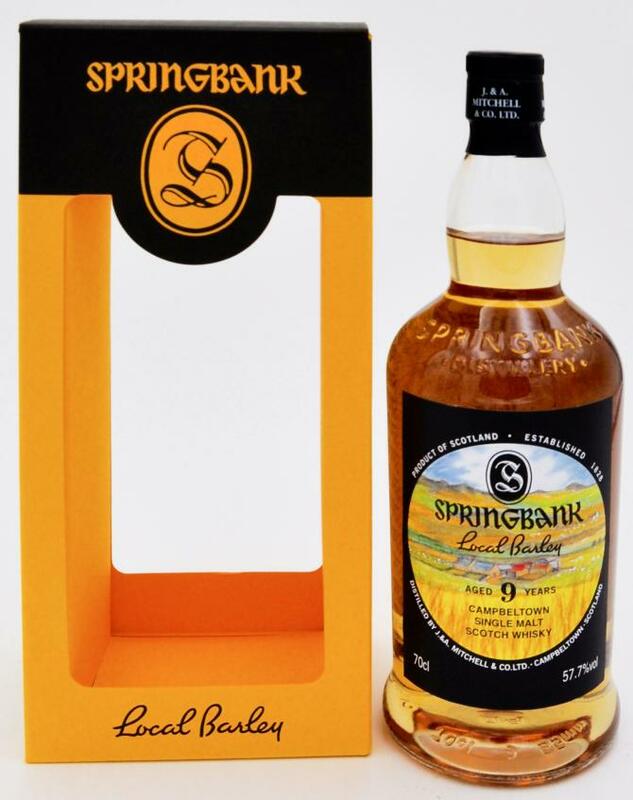 Sweetness of honey and vanilla pushes in the nose - but not for long, because then come the wet pebbles, this mineral note, which is so typical of Springbank and the particularly in Bourbon barrels matured bottlings are particularly concise. Works in addition to the fruit very maritime. Fresh yeast dough. Over time spicy herbal mixture, parsley, pepper and rosemary. Very adaptable nose, which after a while of fructification migrates from fruity to spicy and back to the fruits. Soft and creamy start with lots of vanilla and honey. If vigorous, the power is only a warming one, there is no biting or burning. A salt water-wetted pebble, sucked. From the beginning a little bitter oak - or is that something a smoke note? Hard to say, with a maturity of just nine years rather suggesting smoke. Tangerines and lemons, pepper, chocolate and fresh yeast cookies give a tasty overall picture on the tongue. Medium long and dry, with toffee, vanilla, a hint of honey and lemon juice. It shows well integrated ex-bourbon characteristics (vanilla, caramel, toast) & peat characteristics that are pleasant and not overwhelming. The alcohol is well integrated on the palate and the spirit has good complexity and length as well. Really good - but maybe a bit understated. Score is 89.5 - rounded up out of indulgence. Possible concerns about the young age of this Local Barley bottling successfully and completely eliminated! There is more in the glass here than in many whisky twens. For me as a friend of Bourbon Cask bearings, the combination of 80% ex-bourbon and 20% ex-sherry is almost a dream. In contrast, for me personally, the 12er Springbank CS confidently pack, although the already is great. The barley is to be hoped for as the title of the series and nicely concise, but overall provide oily-maritime and fruity-sweet elements exciting duels, boredom is never from nose to throat - a connoisseur-Malt. In the glass, the straw-golden malt when panning initially forms a sharp edge of liquid, at which then the strong alcohol strength corresponding to strong, viscous drops and legs arise. Grated barley grains and moist soil of a cornfield initially fog your nose, along with dried mangoes and a bit of butter biscuits with warm, spicy softwood honey. Above it all, a slightly alcoholic-fresh stitch with tulips and gherkins floats and next to it an almost tart and cheesy impression of buttermilk, old leather shoes and a discarded bicycle tube. Then take over dune grass and a few algae that dry on the wet sand of the North Sea beach and the old paved groynes. Old damp gauze bandages, cold ashes from the campfire, a few oyster shells and melon slices with Parma ham are a bit further away. The hands seem to be rubbed with camomile hand cream. Behind it, a sherry cloud with apricots, figs, mandarins, overripe pineapple and a touch of coconut bounty wafts, but leaves enough room for the oily-maritime impressions. Exceptionally good. The mouthfeel is full and voluminous, at first pointedly fruity-sweet with fruit grape sugar from the pharmacy, mandarins, caramelized plums and heather honey, but dries the palate but also at the same time with grapefruit, lilac and some old cardboard properly. With grain and nut biscuits, resin and salt liquorice, the oily-spicy consistency of the nose continues consistently. Almost like a rum on the Feuerzangenbowle, almost 60% of the alcohol is hardly noticeable. On the tongue but then started but a slight burning a. Caramel malt, coconut and liquorice as well as used oil and the leather shoes with a few splashes of salt water will not really get rid of in the finish, which I would describe as "long mid-length", and some damp ash clings to a wooden skewer in the throat. Impressively. I had 5cl of this single Malts from Campbeltown. I wanted to enjoy the first 2cl without notes and was startled. I did not like him. Much too spritig the malt appeared to me in the first impression. The remaining 3cl I went on another day more concentrated and read the time for a long time in the glass. I also took water to help the Malt not to be wronged. Mustard glaring malt in my 5cl sample bottle back and forth. When pouring into my glass well-meaning impressions flow into my nose. Narrow windows develop on the glass wall. The whisky collects and the last drops slowly run down the glass. Strong mineral impressions. A bag full of cereal in which you put your nose. A slightly distant sea breeze mingles with lovely vanilla. Unfortunately I feel the alcohol as very young and metallic. So I'm not happy to be reminded of New Make at a malt - but unfortunately this is the case here. Over time, I discover fresh lemon zest, clearly sweet honey and a pleasant Pfeffrigkeit. Slightly musty flower beds and an oily impression line up. The young alcohol is now much less disturbing and fruits are more visible. I think blueberry and elderberry, but also some sweet / bitter orange. The aroma described in a few words: Sparkling, fruity, sweet with a hint of sea air. Approximately 57% Vol. Can not smile away. You do not need water to make the malt drinkable, but it does have a decent start. Enormous sweetness, followed by some saltiness and the seasoning on tap. The first impressions I like - but not overwhelming. Above all, it is the grain that stays in my memory. Besides some vanilla and pebbles and a bitter transition to the finish. Lots of spices, salt and minerals. The medium-long finish is a bit bitter and again shows a slight tendency to youth, which I really had not noticed in the taste. The scotch is a bit bitter and slightly sour. Sourdough and above all yeast, as well as some green vegetables, parsley and subtle smoke form the conclusion for me. I have not been so torn between positive and more negative impressions for a long time. The aroma is complex - no question. However, I do not like the flavors that seem too young to me. After my tasting, I read Notes, which described just this as an advantage. I can not agree with that. I am also nobody who would describe New Make as good or as pleasure. I taste it to learn, to experience, but that's about it. In my Single Malt (at least nine years old), I do not want to be reminded of Obstler, Korn or whatever. Apart from these flavors, which I dislike, I like the nose quite well. The taste, as well as the finish are not highlights for me, but certainly pleasant to drink. Something simple, but good. Fruit juice with Springbank smokiness. This can't come as a surprise, but they really are doing something right in Campbeltown. Very rich and full-bodied. Hints of tar and kerosene, with a whiff of bonfire smoke. It's not all hell and brimstones though, far from it. There's a honey-like sweetness, accompanied by cookie dough and sprinkles of lemon zest and grapefruit, as well as a subtle maritime influence. Becomes more minerally (is that a word?) with time. Heavy and oily, with a big initial hit of lemon zest and lime, as well as pink grapefruit. Whispers of nectarines too. Followed by some brine and soft peat smoke, as well as a hint of menthol. So, so good. More of the above. Long.